Hello there and welcome to my brand-spanking new website! I hope you will find it a lot clearer and easier to use than it’s previous incarnation and hopefully a little easier on the eye too! I decided to scrub-up a bit for the new look, the photos were taken by the wonderful Benjamin Borley and i chose my favourite old seaside theatre as the location; the Manor Pavilion in Sidmouth, did any of you guess??! My new Special Commissions EP is now released to coincide with the launch of this new website and it is comprised of songs i have been asked to compose and record for various special projects which were all un-connected. People kept asking me for the individual songs and i didn’t know what to do with them until i had the brainwave of putting them all on an EP together as there wasn’t quite enough for an album but they all share a common thread of a sense of place and time. I hope you enjoy them as much as i enjoyed composing and recording them. I have a busy summer coming up with several exciting projects on the bubble… the Villages in Action ‘UNEARTH Year 2′ is now in full swing and the team are thoroughly enjoying getting stuck into the research for the this years four “villages” of Buckfastleigh, Chagford, Crediton and Brentor. More info on the shows will be added when the dates are confirmed so keep your eyes peeled! Lastly the debut album by The Band of Love; ‘Folk Fever’ “folk reimaginings of 1970’s disco classics” is due for general release this coming September, there is a new teaser video of one of the tracks i lead ‘I Am What I Am’ available on YouTube (visit my MEDIA page) and Alice Jones’ ‘Put You Together Again’ is also available to download from iTunes, Apple Music, Spotify etc etc. Again keep a look out on my CONCERTS page for news of our very exciting debut live appearance, it’s a good ‘un!!! Thanks for visiting and see you at a summer festival near you very soon! Hello everyone, i hope you’ve been enjoying the traditional summer weather wherever you are! 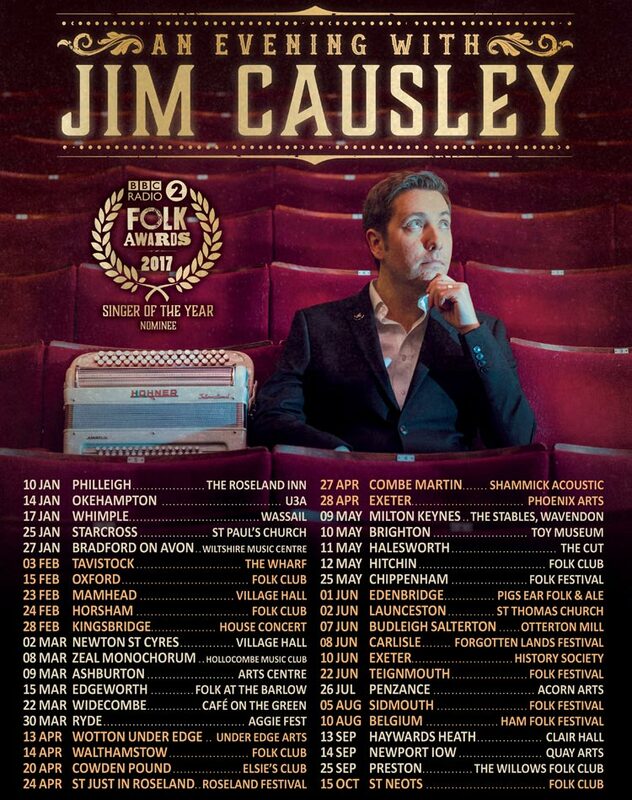 I’m busy hopping about festivals with Nick Wyke & Becki Driscoll as the Jim Causley Trio, do take a peek at the gigs page and catch us at a festival near you! Otherwise I am busy with the Villages in Action team working on the shows for the three remaining villages in the Unearthed tour: Rattery, Starcross and Cheriton Fitzpayne, all taking place in September so that means many new songs to be written! Well 2016 has certainly been a busy one for me! As well as releasing not one but two albums i have also appeared as a guest on the albums of four other artists; Hannah Sanders & Ben Savage superb debut album as a duo, a tribute album to the late Tony Dean featuring friends of his performing a track each of his wonderful songs, the long awaited debut album of folk father extrodinaire Geoff Lakeman and an eargely anicipated new album from folk legend Chris Foster, now residnet in Iceland, this new album has been produced by Jim Moray and features a host of special guests. More info about all of these albums is available on the Discography page of this website. And no rest for the wicked; i’ve already begun work on next year’s album! 2017 is the centennary of Charles Causley’s birth and the Charles Causley Trust have commissioned me to make another album as part of the centennary celebrations. I did not want to try and make a ‘Cyprus Well 2′ so this time i had a short residency in Cyprus Well, back in the autumn where i composed the music for the poems and as Charles’ Collected Poems for Children is being re-released next year with a new foreword by Sir Andrew Motion and the Trust are involved with lots of projects with schools in Cornwall i thought it would be fitting to focus on his childrens poems this time around and make a children’s album! It’s going to be great fun, i’ve picked some classic poems and some less well known ones and have lined-up a great gaggle of musicians to help bring it to life. It will be launched at Launceston’s annual Charles Causley Festival in eary June. I think that’s all you need to know about for now! There are other ideas bubbling away for 2018 but i’ll save that for another time! 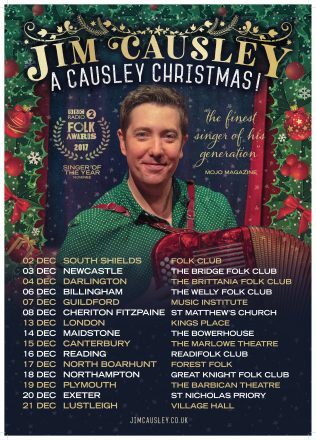 I hope you’ve all had a great year, i have very much enjoyed all my various concerts up and down the land, solo and with Nick Wyke & Becki Driscoll performing the Forgotten Kingdom album as well as the Jack Clemo project with author Luke Thompson. Many more dates coming next year which i am very much looking forward to. Helloo everybody, here’s the latest news: as many of you will be aware, the new album has been somewhat delayed given that i did a “launch concert” at Sidmouth this summer with no CDs to launch!!! I won’t go into details but due to myriad issues of delay on the production side of things we were forced to push the official release date back to 19th February. The lovely people at the Kings Place in London very kindly moved my September date there to the 17th February and so that has become my new launch date along with a somewhat more intimate gig earlier that same week here in Devon. I cannot deny that i am hugely excited about this new album and simply cannot wait for you all to hear it. The delays have only served to concentrate the excitment, very much like a heavily shaken bottle of fizzy-pop! I’ve managed to get most of the Devon folk scene guesting on the recordings and a few neighbouring friends too. I’ve had the most lovely time recording it in the beautiful Blackdown Hills with the splendid Mark Tucker and i’m confident that all of that fun of making music with friends in such a beautiful environment has poured into the songs and will splurge out into your living rooms/cars/jacuzzis/dungeons and fill your hearts with joy! Incredibly, this is the first record i’ve ever made in Devon! Sure i’ve done bits and bobs on friends recordings over the years but never one of my own! First three solo albums were recorded in Hampshire as was the Devils album, the Mawkin:Causley albums were recorded in a windowless warehouse in South London and Cyprus Well was of course recorded in Cornwall so this one has been a real treat in many respects. I also cannot wait for y’all to see the new artwork. As it is a bit of a decennary celebration i had to get David Angel back down to Devon like he did for ‘Fruits of the Earth’ back in 2005. We again, had a blast and i took him to quite an unusual location, deep in the foothills of Dartmoor, poor bloke, lets just say it gave him plenty of stories to take back up to London! ‘Song to the Tin’ on BBC Countryfile! xciting stuff folk fans; i had a phone call from a lady at BBC Bristol earlier this month saying that Countryfile were making a programme about Dartmoor due out later in June and that their researchers had come across my song ‘Pride of the Moor’ which i had been commissioned to write by Exeter’s Spacex Gallery last year, celebrating the tin mining heritage of Dartmoor. After my interview with Mr Craven we had to move to another rock to get ready for filming the song, John stood up and moved on first then i picked up my accordion and proceeded to follow him. After only a few steps i suddenly felt/heard a crunch under my feet… i’d only gone and stepped on Mr Cravens spectacles!!! Of course i apologised profusely, John said “no no no, it’s my fault for leaving them on the ground”. Unfortunately he still had a few shots to film that day so the film crew were going to try and either film him from the side of the un-shattered lens or film him a little blurry from a distance… he won’t forget me in a hurry!! !